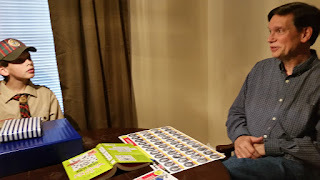 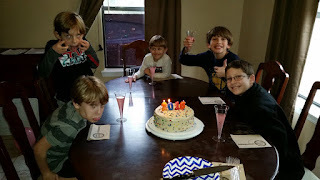 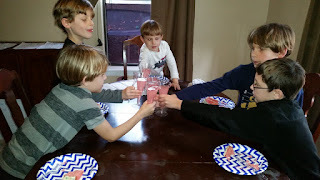 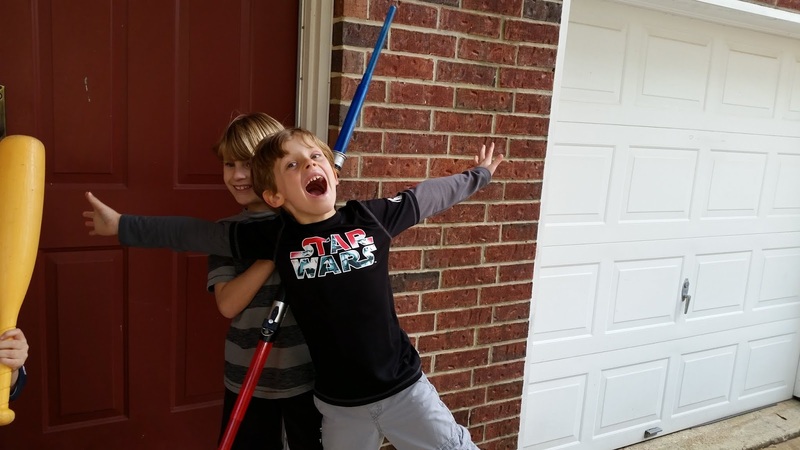 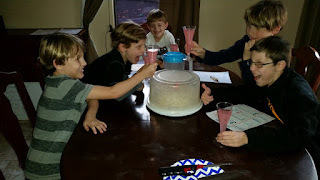 I know that this post is out of sequence, but I somehow forgot to post it long ago, and the pictures bring such good memories so I had to include it in our blog. So . 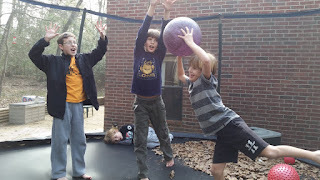 . . here's our New Years post a couple of months late. 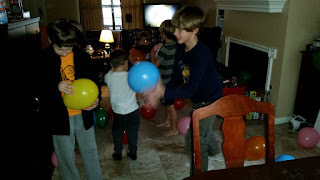 A few years ago we started a tradition of having a New Years Eve party. We invite a few friends over for fun and games in the morning/afternoon, do a balloon drop at 12:00 noon, and have fun foods. 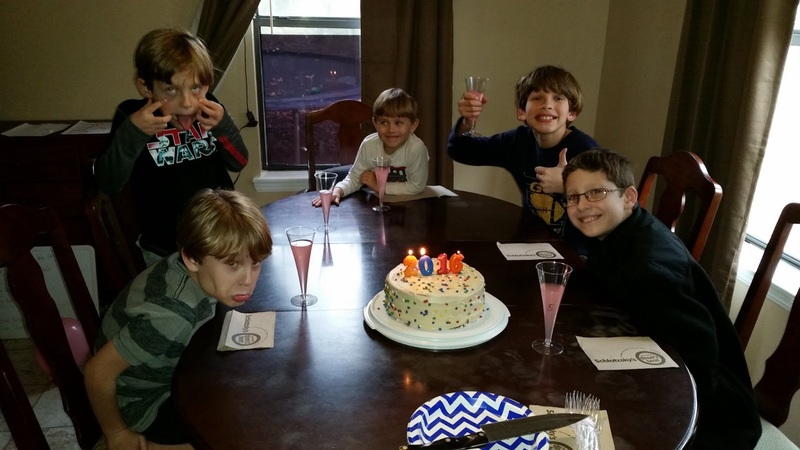 The Brown boys joined us this year and we had a great time ringing in 2016!! 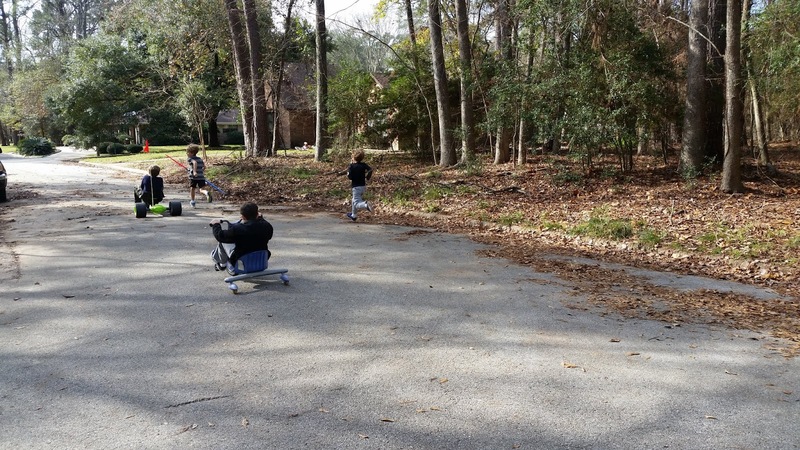 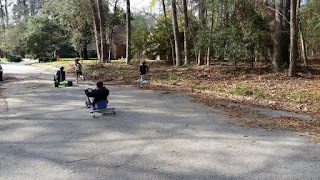 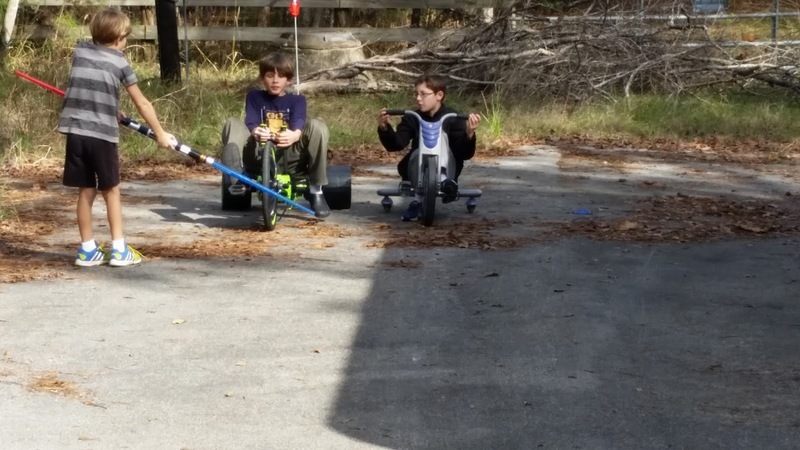 Love all the kids riding, running, and playing outside. 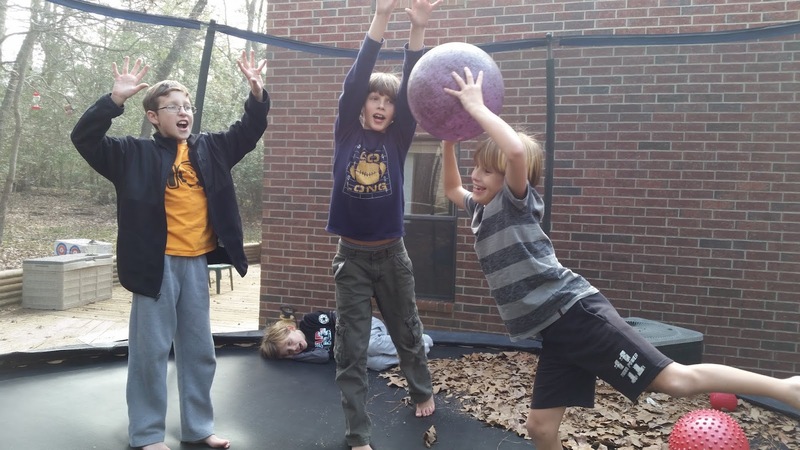 The big kids had fun on the trampoline. A blurry balloon drop. 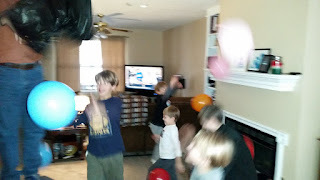 They were all running and jumping around as the balloons rained down on them. And then there's the fun of bopping the balloons around. 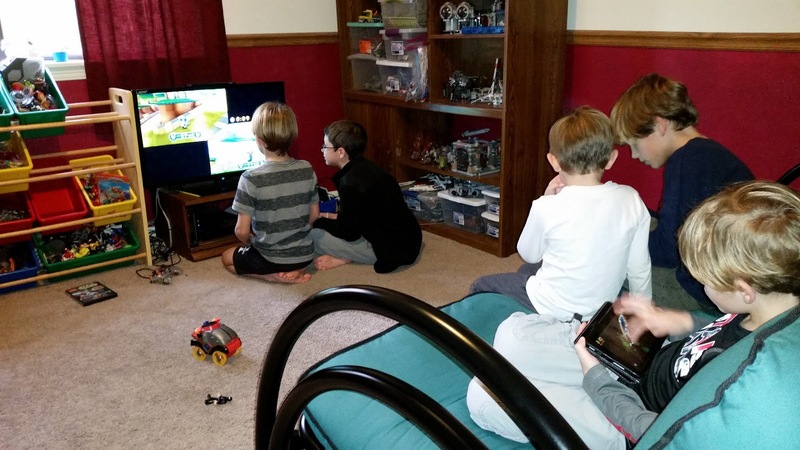 Some video game time, of course. 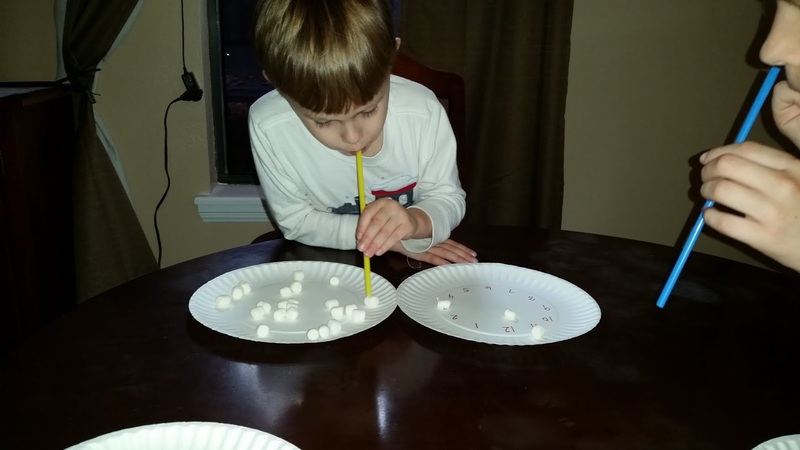 Minute-to-win-it marshmallow game. 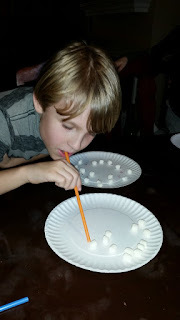 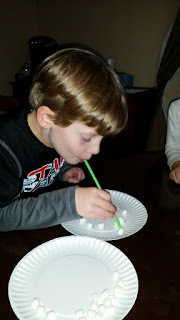 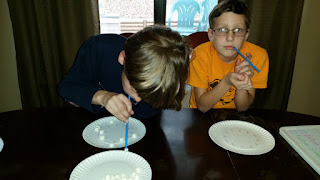 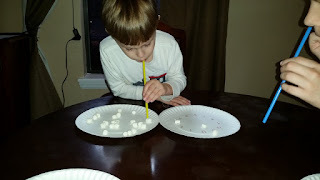 They had to use a straw to get marshmallows from one plate onto their New Years Eve clock plate. 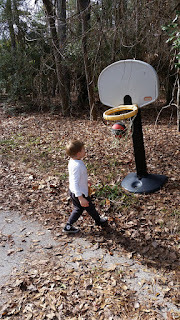 Dawson up next, while Seth awaits his turn. This was a fun one! 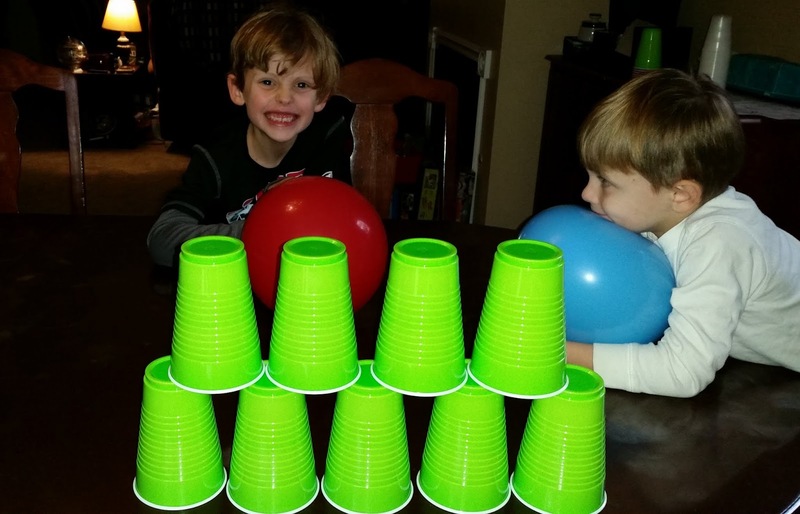 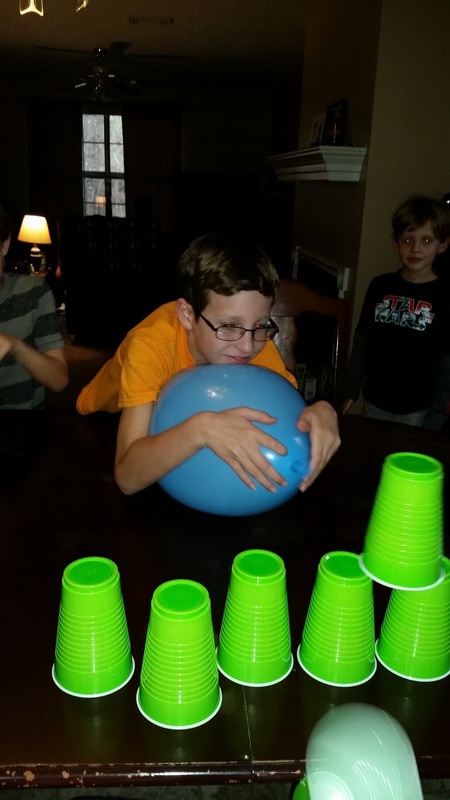 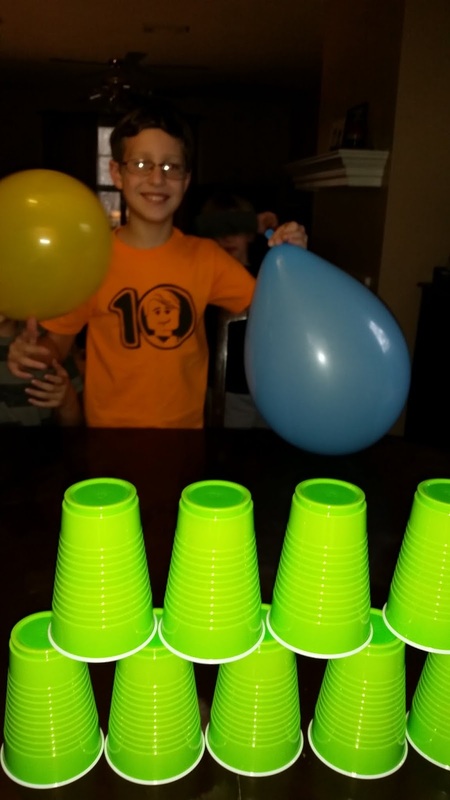 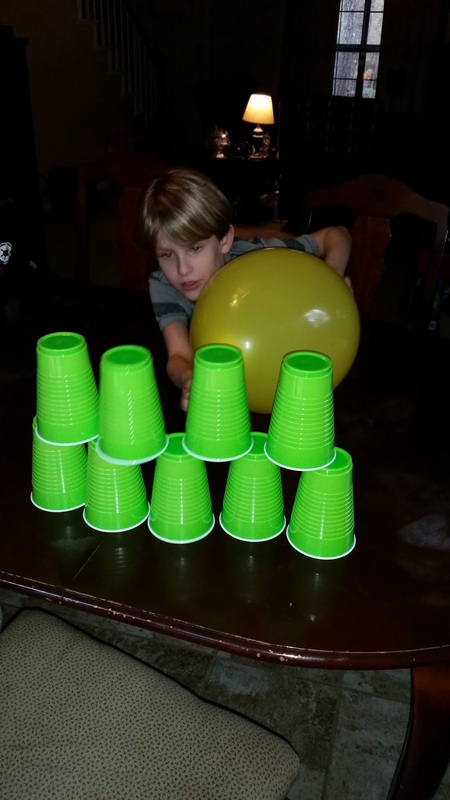 They had to blow up a balloon and then use the air from the balloon to "blow" the cups off of the table. 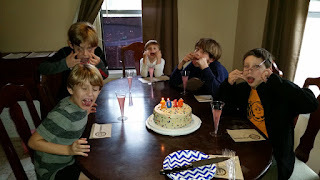 Hahahaha!!! Brady is so ready. And I love the way that Amos is watching. 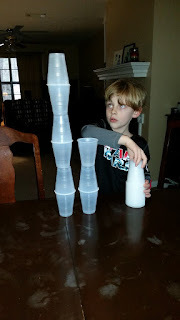 A minute to make a cup tower. 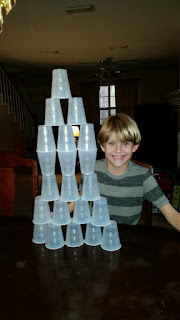 His completed design. 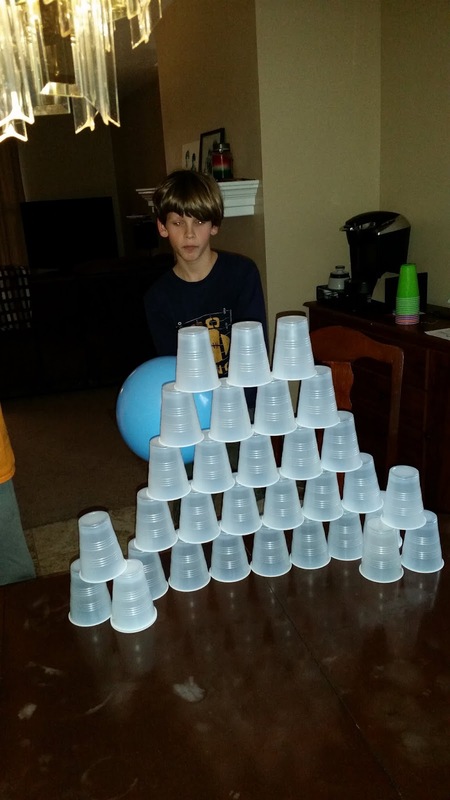 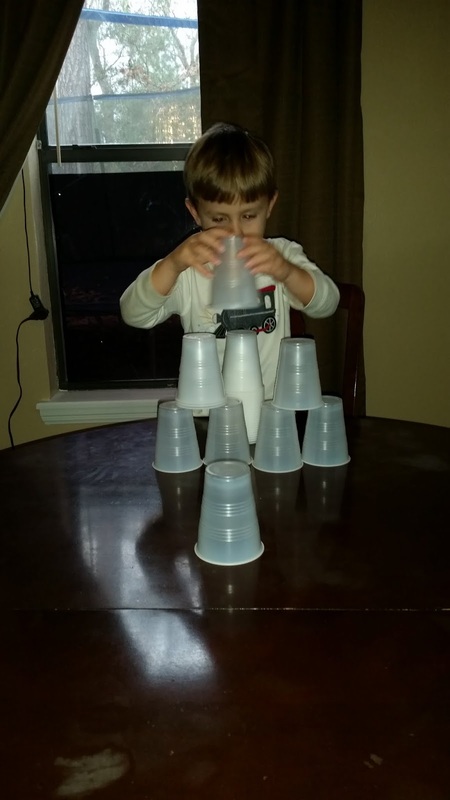 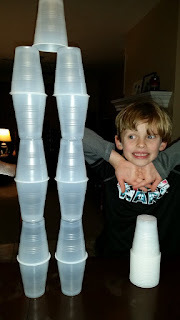 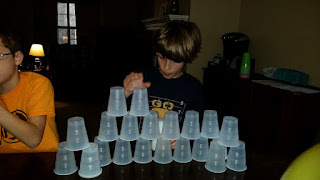 He didn't use the most cups, but he was very creative in his design. 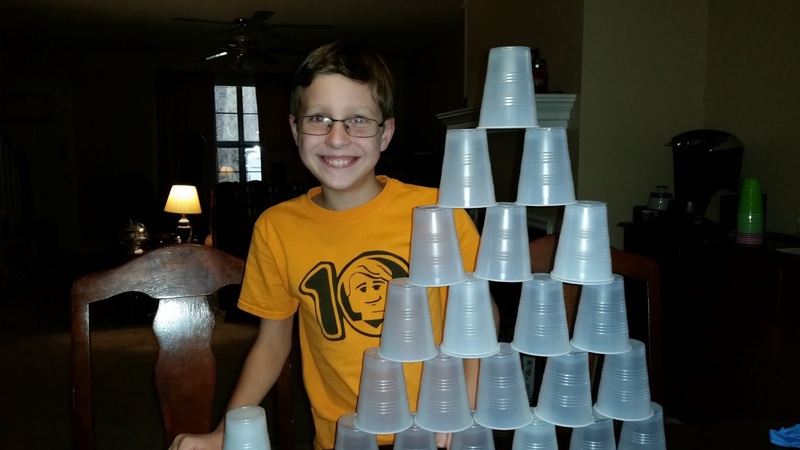 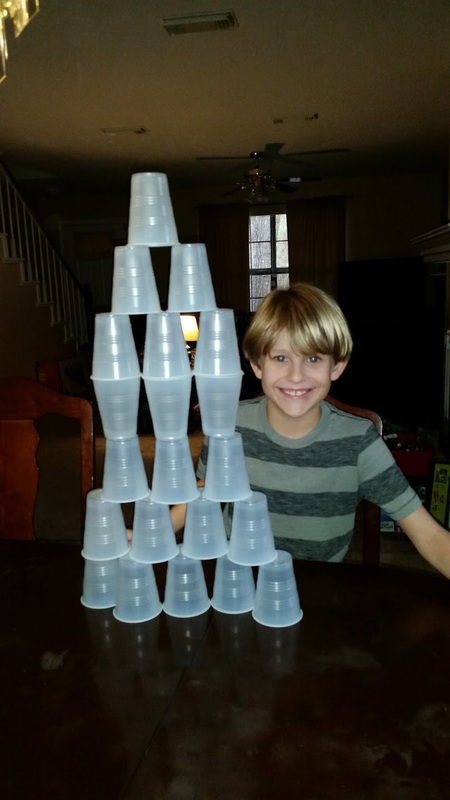 Awe, Seth and his awesome cup tower. 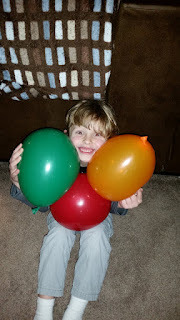 What a smile! Cy is happy about his final tower. 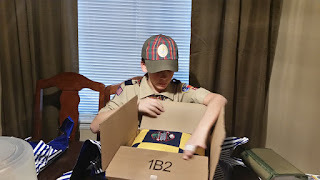 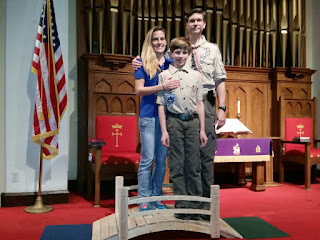 We now have a BOY SCOUT in the house! 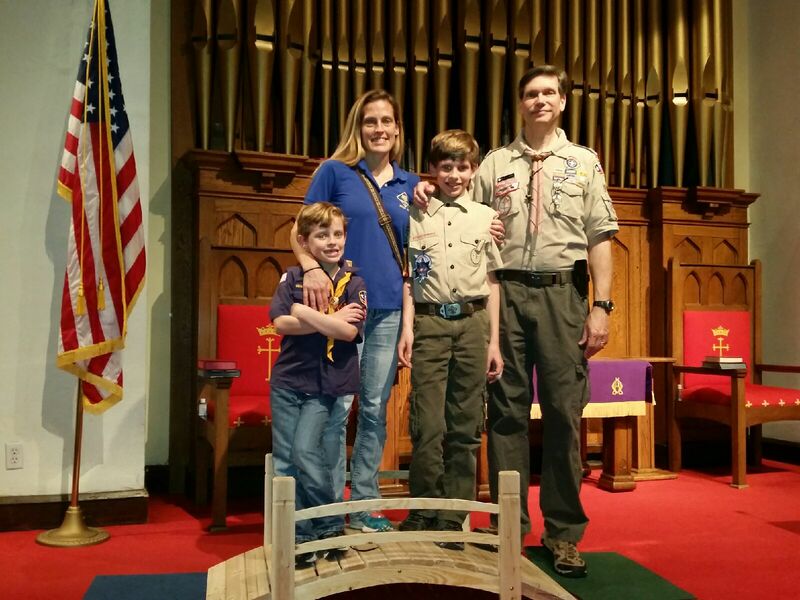 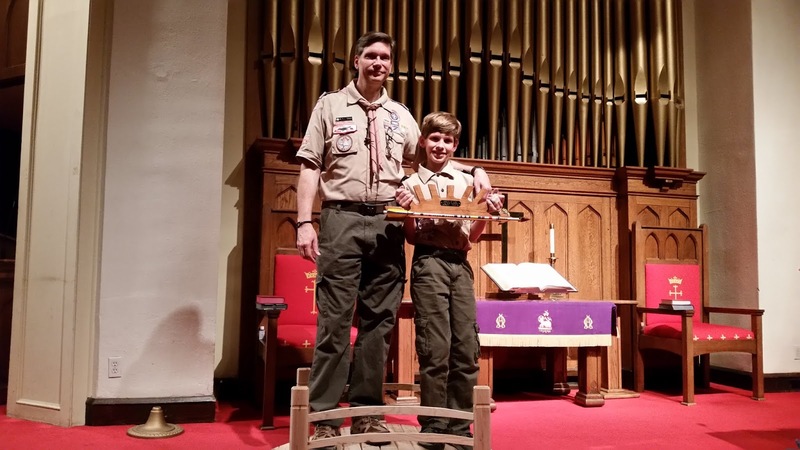 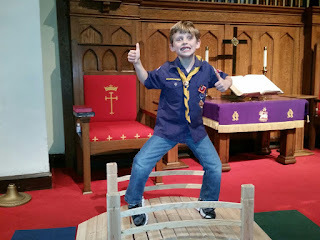 Dawson crossed over from Cub Scouts to Boy Scouts at a very nice and meaningful Crossover Ceremony that Randy helped to orchestrate. 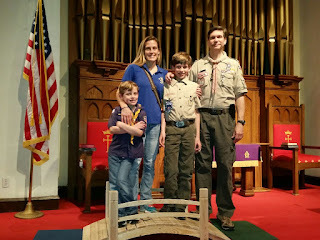 Talking to Dawson about all of his Cub Scout accomplishments, how proud we are of him, and all that he has to look forward to in Boy Scouts. 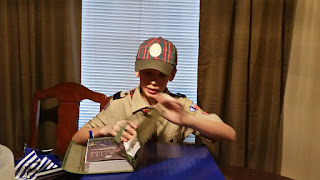 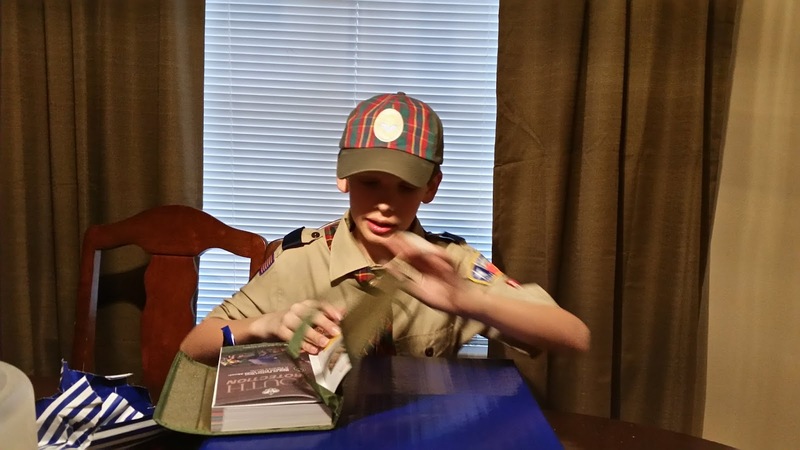 Opening his new Boy Scout Handbook. 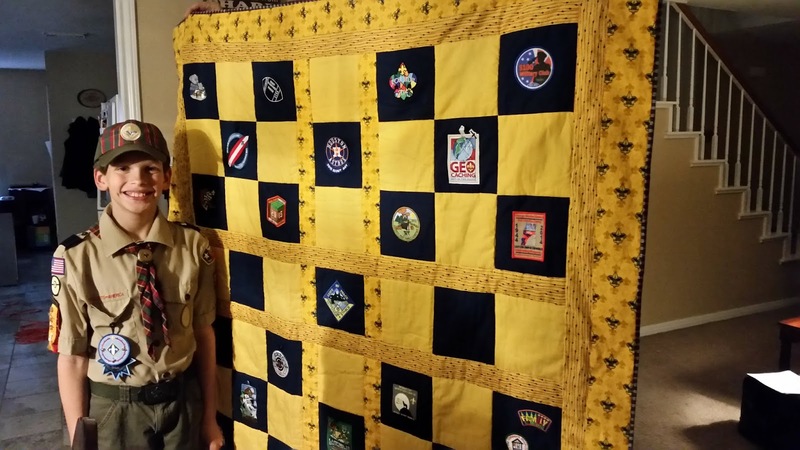 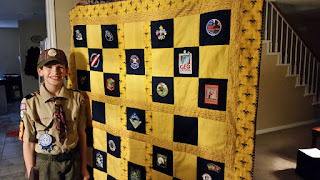 And the highlight gift - a homemade quilt with all of his Cub Scout patches, made by our wonderful and talented friend Aimee. 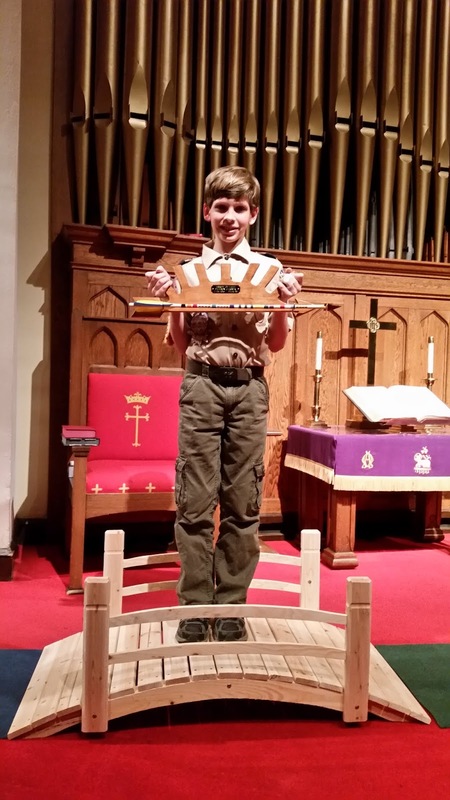 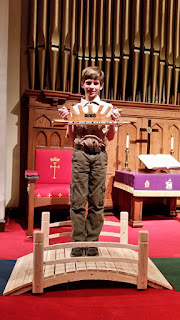 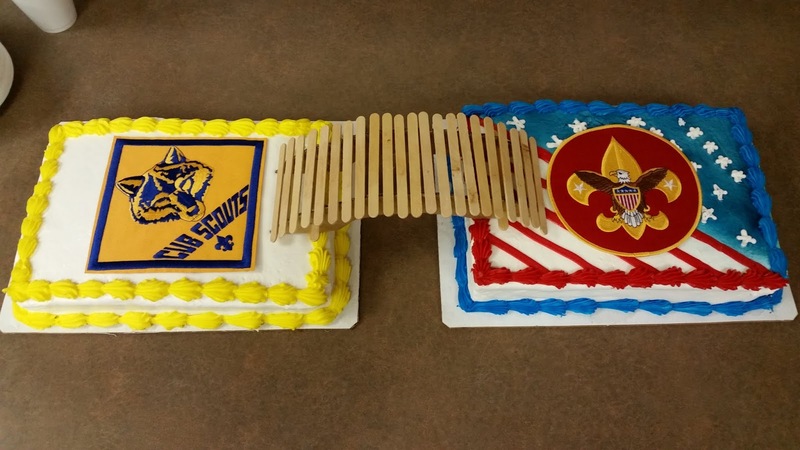 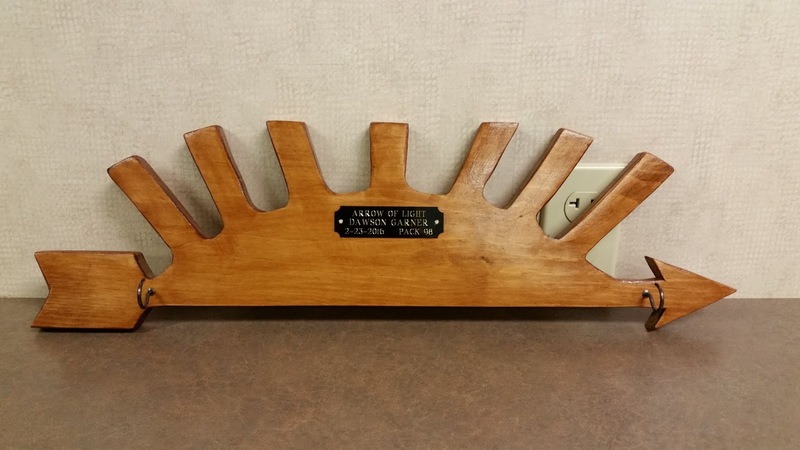 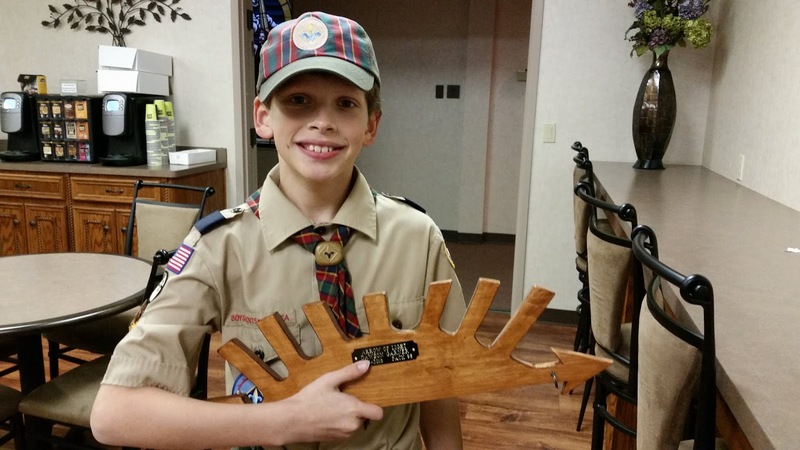 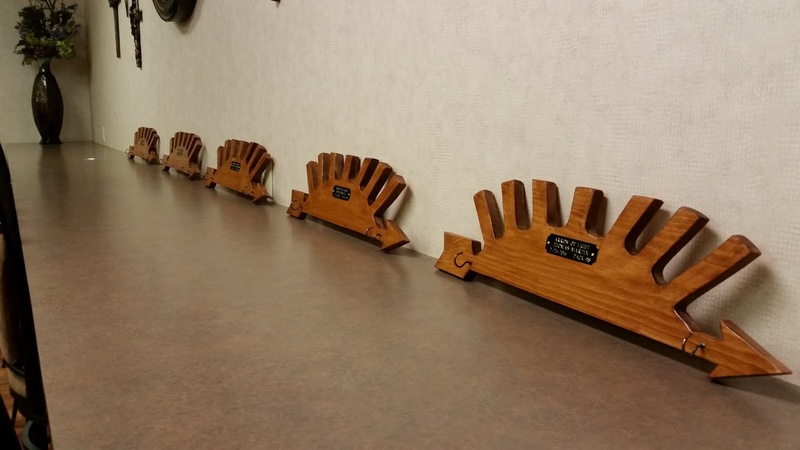 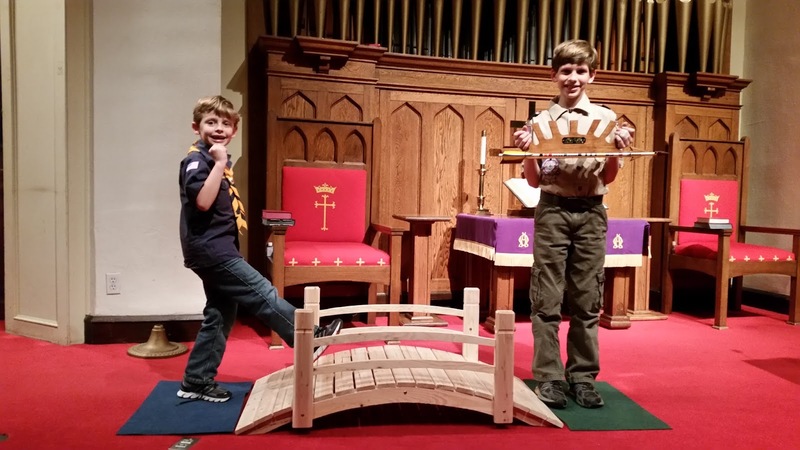 Arrow display holders made by the Boy Scout troop leader of Troop 98, Dawson's new scout home. 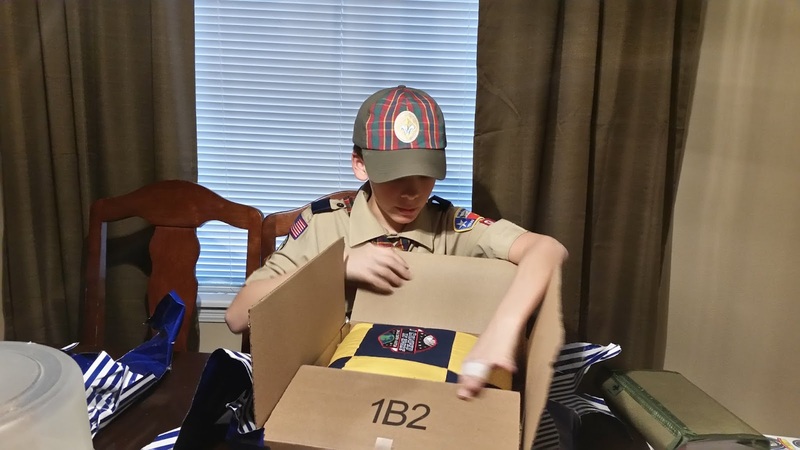 Dawson was very happy to receive it. 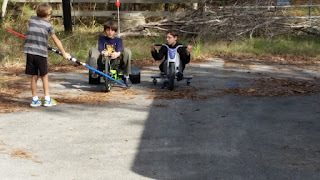 The Minion Patrol!!! Such a great group of boys. 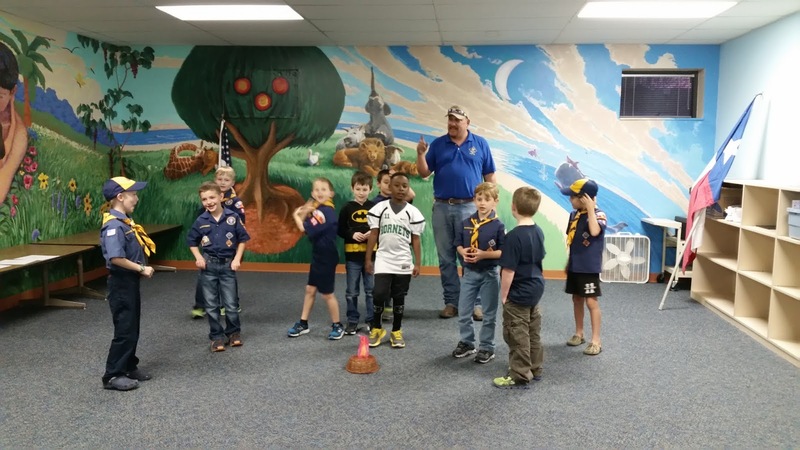 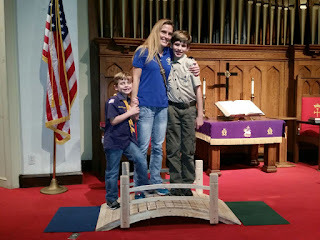 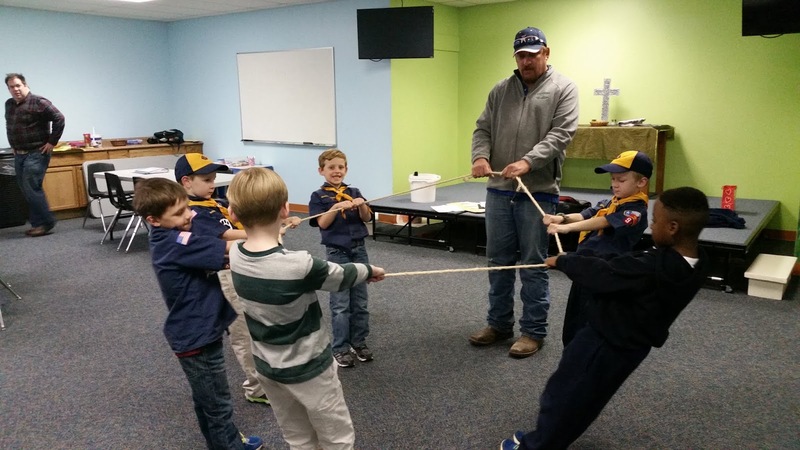 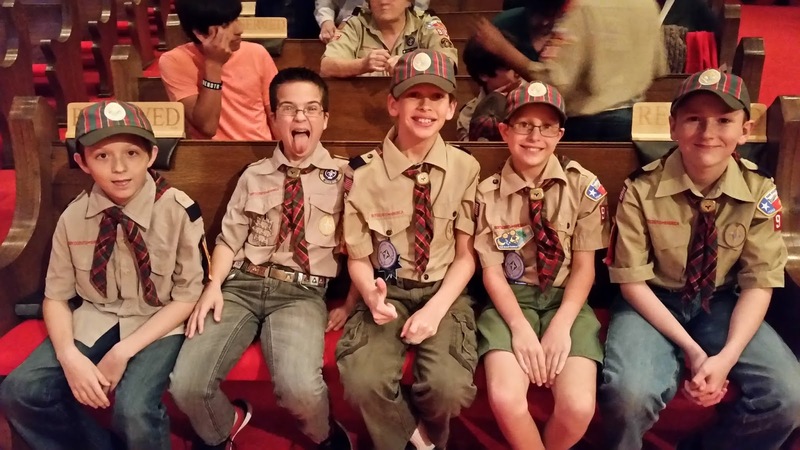 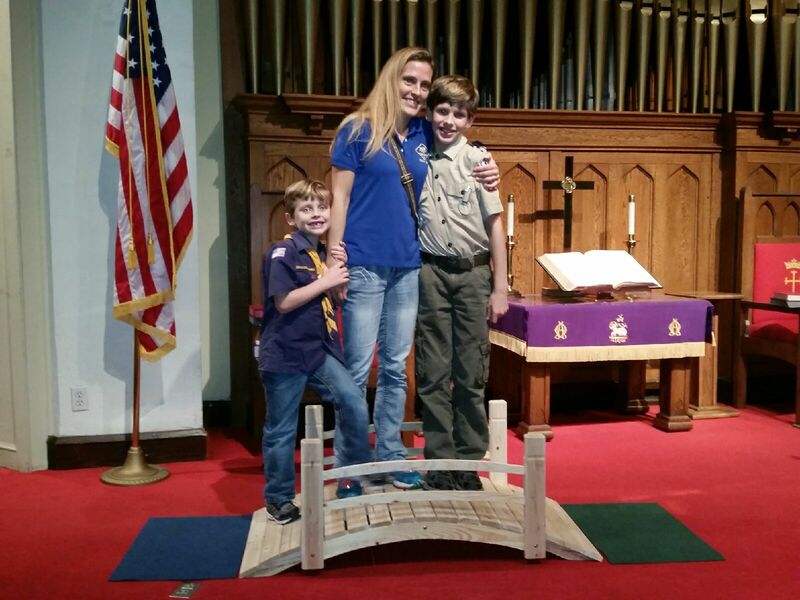 Now we have one Cub Scout and one Boy Scout. A game of trust, as they all pull on the rope, trusting their scout friends to do the same so that no one tumbles backward. They start each Den Meeting with an opening flag ceremony. 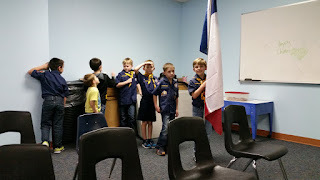 Brady has the Texas flag this time. 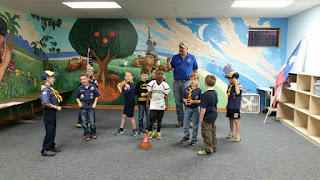 Performing a skit. 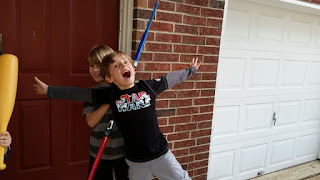 It was a silly one and they had a lot of fun with it. 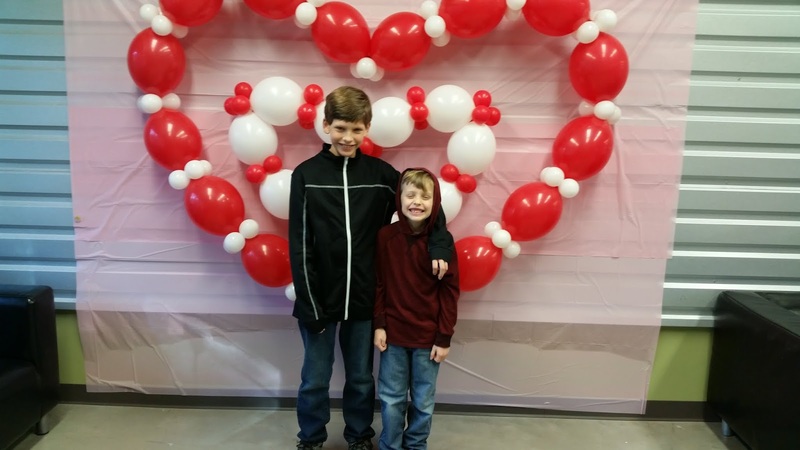 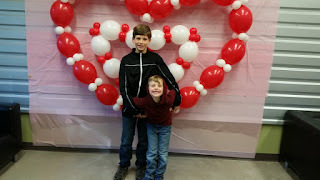 Pictures in front of the heart balloon backdrop at our annual H2O Valentine's Party. I failed to take more picutres of our fun Valentine's party. 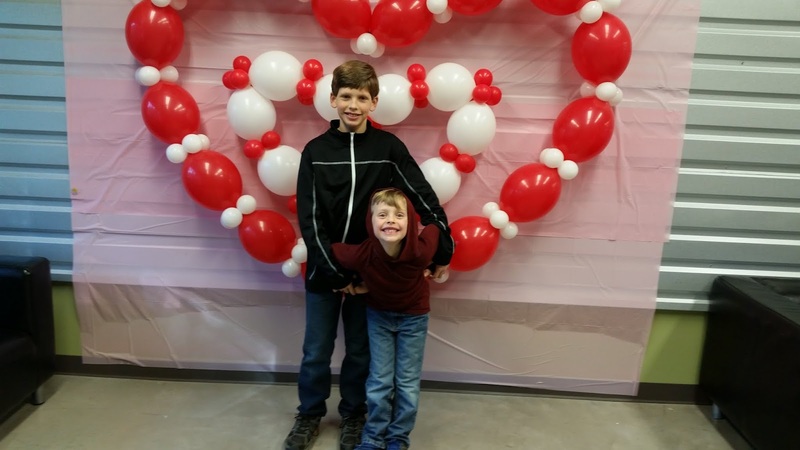 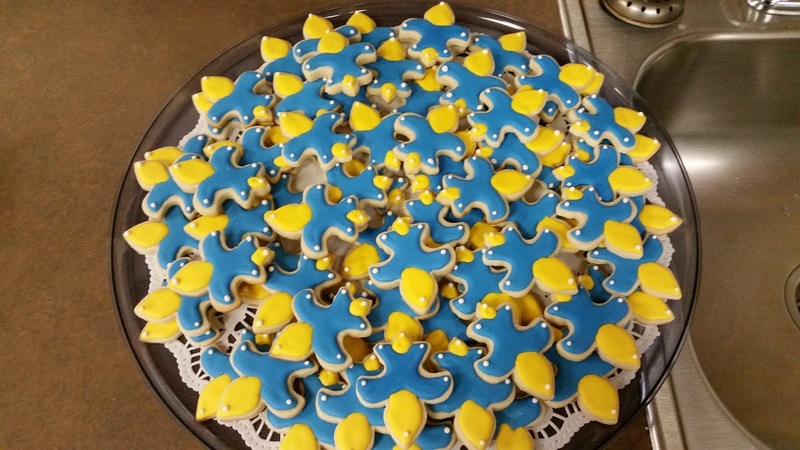 There were lots of great games, crafts, homemade Valentine's card boxes and a card exchange, and lots of yummy food! 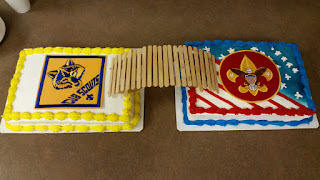 It was a wonderful celebration, as usual. 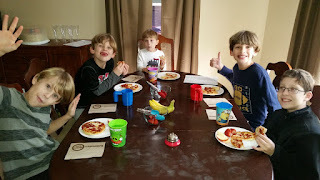 Thankful for our homeschool group!